Hang on to your butts, because it’s time for some pandering 90s nostalgia. Did you hear that? 90S NOSTALGIA. Put that in your SEO and smoke it. As one of those dreaded children of the 90s (sort of? I vaguely remember seeing A Goofy Movie in theaters), I grew up during the heyday of Nickelodeon cartoons. Shows like Rocko’s Modern Life and Hey Arnold were well above my maturity level. However, we deserved these shows. We were smart enough and brave enough for them. After all, this was America before it started canceling movies. Anyway, kids shows can teach a lot of valuable lessons that don’t actually make sense until much later in life. There is something special about Rugrats, a cartoon about rebellious talking babies, that used to strike such a cord with me. In Rugrats, the Pickles family was Jewish. Well they were half-Jewish. “Just the good half,” as my man Henry Hill would say. While Judaism was not a typical topic of conversation in the Pickles household, the show brought it up at all the right times. This came in the form of two very memorable holiday specials: A Rugrats Passover and A Rugrats Chanukah. I like to complain that there aren’t nearly enough Hanukkah stories out there. While Hanukkah isn’t that important of a holiday, it can still feel lonely to be a Jew on Christmas, so a little consolation would be nice. You see, there are a lot of Jews working in Hollywood, as Mel Gibson might tell you. Unfortunately, a lot of those Jews aren’t telling very Jewish stories. 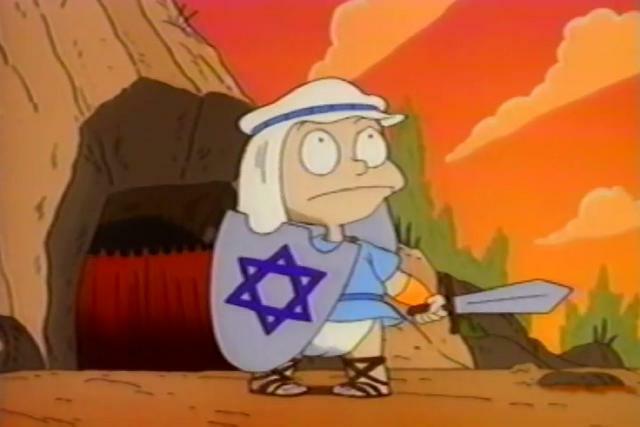 That is why it was so nice to see how generous Rugrats was with its Jewishness. Not to mention, while Hanukkah is a pretty simple holiday, a lot of non-Jews still don’t seem to completely understand it. “So like, if it’s about candles… then why do you get presents?” I don’t know, your holiday is about the birth of Jesus, yet you decorate trees. All holiday traditions are a little bit weird. That is what makes them so special. It is the slightest bit comforting that A Rugrats Chanukah was the first exposure to both the holiday and the religion for many people. But it also gave a lot of Jewish kids a chance to see their life on television. With this and Eight Crazy Nights, it seems like only cartoons know how to handle Hanukkah. Step it up, Hollywood, I want to see Home for the Challah Days already.